Iconic Tribeca skyscraper building by celebrated Swiss architects firm. Views offered from the uppermost penthouse, from approximately 800 feet above street level, in an article on YIMBY. 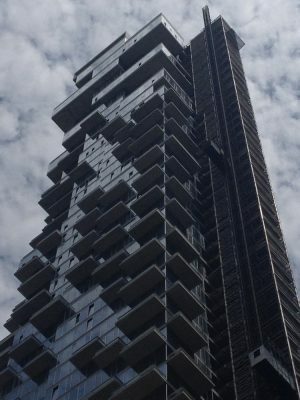 The sturdy 821-foot tall tower contains 145 condominiums. Due to a lack of adjacent towers (unlike Midtown or further south in the financial district) it is highly visible from many parts of Lower Manhattan. Unusually the building uses a lot of express concrete, unlike the glass and steel facades typical of the World Trade Centre site just to the south. The 52nd-floor penthouse was recently purchased for $17.3 million. The pricier penthouses are expected to sell for as much as $34.5 million for 5,489 sqft. 56 Leonard Street Tribeca Building article in YIMBY. New York, NY…Since its formation in 1978, the Basel, Switzerland-based architecture firm Herzog & de Meuron has achieved international renown for buildings – houses, libraries, schools, stores, museums, hotels, factories, arenas – that strike an uncanny balance between strict refinement and pure invention, practicality and the sublime. 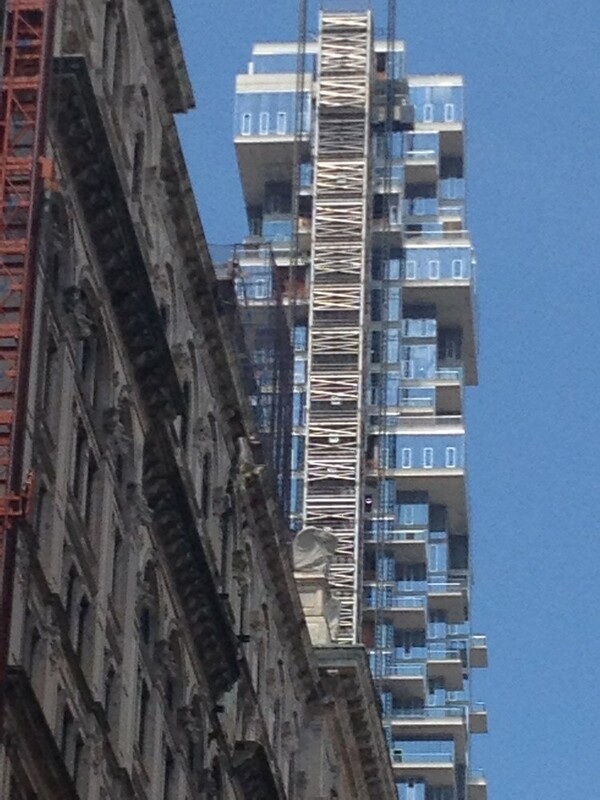 Herzog & de Meuron’s 56 Leonard Street within the context of downtown New York city, looking south toward the Woolworth Building (at 57 stories like 56 Leonard, it was briefly the world’s tallest tower when completed in 1913) and the Wall Street district. 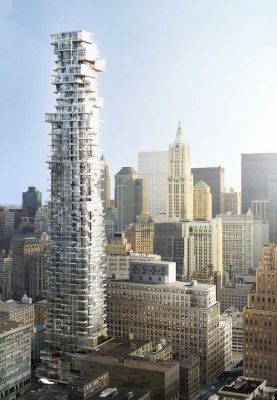 On the threshold of its fourth decade, Herzog & de Meuron is poised to reinvent another great architectural prototype as construction begins in New York City on the first high-rise tower of the firm’s career. 56 Leonard Street will be a 57-story residential condominium building at the intersection of Church Street and Leonard Street in the Tribeca Historic District of downtown Manhattan, where it will rise above cobbled streets and historic 19th century neighbors. The tower will house 145 residences, each with its own unique floor plan and private outdoor space, in a veritable cascade of individual homes that the architects describe as “houses stacked in the sky,” blending indoors and outdoors seamlessly together. 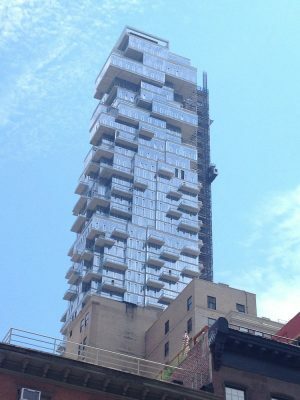 With its articulated surfaces, dramatic cantilevers, profiled slab edges, profusion of balconies, expanses of glass, and views from downtown Manhattan to as far as the Atlantic Ocean, Herzog & de Meuron’s 56 Leonard Street breaks down the old image of the high-rise as a sleek, hermetically sealed urban object to propose instead a thoughtful, daring and ultimately dazzling new alternative – the iconic American skyscraper re-envisioned as a pixelated vertical layering of individually sculpted, highly customized, graceful private residences opening to the atmosphere. 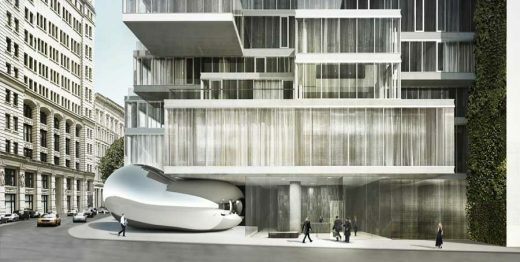 Rendering that shows the base of 56 Leonard Street with its site-specific commissioned sculpture by Anish Kapoor, integrated into the architecture, and the bold cantilevers and modulation of the structure above. Kapoor’s sculpture, with the building’s entrance adjacent along Leonard Street, will be his first permanent public work in New York City, a landmark on the corner of Leonard and Church Streets in the Tribeca historic district. The architects’ design for 56 Leonard Street also updates the relationship between private tower and public streetscape with an articulated base whose cantilevers generate a sense of movement and permeability. Here, the building’s defining corner will be the site of a major commissioned sculpture by internationally celebrated London-based artist Anish Kapoor. Fully integrated into the architecture itself as if to say that culture and the city are indivisible, Kapoor’s massive, reflective stainless steel piece – an enigmatic balloon-like form that appears to be combating compression from above – will be a new cultural landmark in Tribeca and the artist’s first permanent public work in New York City. 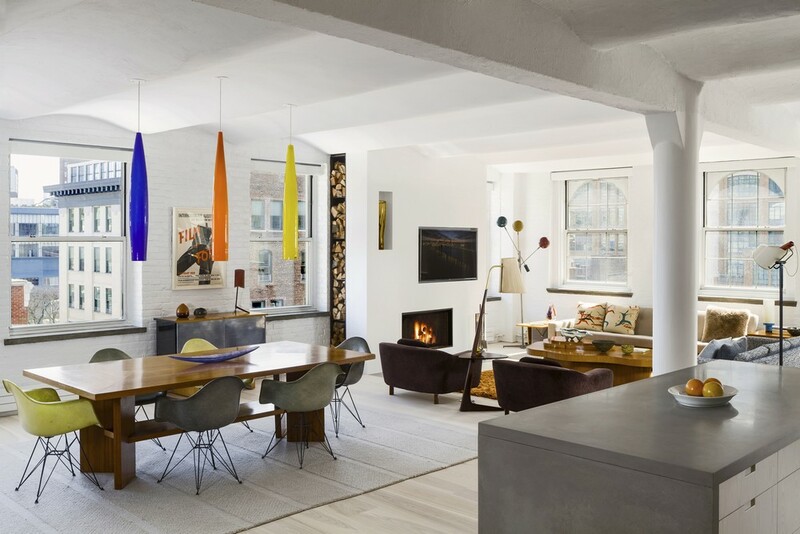 Kapoor’s sculptural contribution to 56 Leonard Street extends his ongoing exploration of physical and psychological space, as in such works as the “Cloud Gate” in Chicago’s Millennium Park and the recent mammoth temporary installation “Sky Mirror” at Rockefeller Center in Midtown Manhattan. Rendering that shows the crown of Herzog & de Meuron’s tower 56 Leonard Street, where penthouses occupy full-floor glass boxes that have the effect of being staggered and shifted atop one another. With extensive outdoor spaces and views in every direction, these homes in the sky offer views across New York City and New York Harbor to as far as the Atlantic Ocean. Homes available at 56 Leonard Street will range in size from 1,430 square feet to 6,380 square feet, and will include two- to five-bedroom residences and ten penthouses. 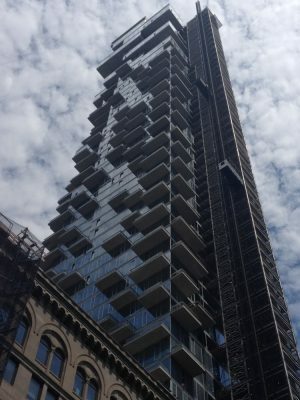 Prices for the residences at 56 Leonard Street range from $3.5 million to $33 million. 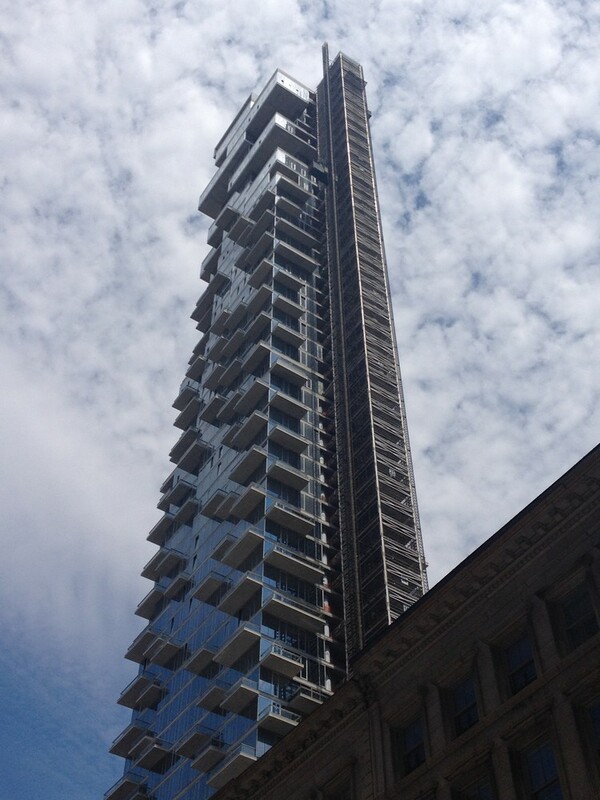 56 Leonard Street has been developed by Izak Senbahar and Simon Elias of Alexico Group LLC, New York City, developer of such acclaimed Manhattan projects as The Mark by Jacques Grange and 165 Charles Street by Richard Meier. 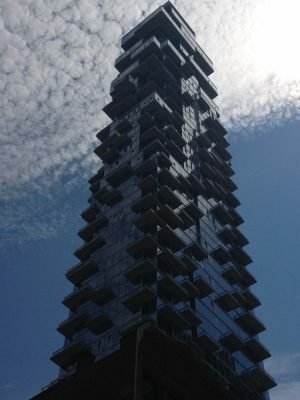 Costas Kondylis & Partners of New York City is serving as executive architect for the building. Construction manager for 56 Leonard Street is Hunter Roberts, New York City. Exclusive sales and marketing agent for the project is Corcoran Sunshine Marketing Group. Image of the dramatic top of the building at dusk. Occupancy at 56 Leonard Street is anticipated in late fall 2010. Rendering shows 56 Leonard Street (center) glowing in the night sky, with New York City below.